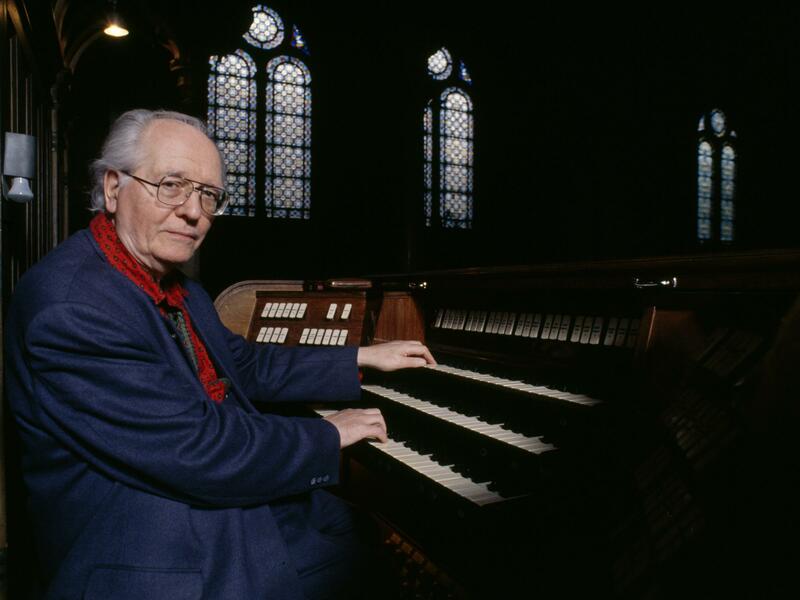 Composer Olivier Messiaen in 1983, at the organ at the Trinité church in Paris where he held the post of organist for over 60 years. Conductors, like most music lovers, keep discovering music that is new to them. My own latest discovery is the Turangalîla-Symphonie, a mind-blowing 75-minute orchestral piece by Olivier Messiaen, written in the 1940s. It's a rare treat for me to be able to work on a piece from the middle of the 20th century that I have never even heard performed live. I'll admit, the Turangalîla-Symphonie has been on the Baltimore Symphony musicians' wish list since I became music director in 2007 – and clearly for much longer, because this week marks the BSO premiere of the work. Messiaen is a composer whose orchestral music is not often performed. I don't think it's entirely because his music is thorny or avant-garde, but because of a much more pragmatic reason that has to do with logistics. Turangalîla is scored for a very large orchestra, plus solo instruments. But his last completed work, Éclairs sur l'au-delà ("Lightning Over the Beyond"), from 1992, is 70 minutes long and requires 128 players, including 10 percussionists. Equally epic is Des canyons aux étoiles ("From Canyons to the Stars"), which doesn't require hundreds of players, but is over 100 minutes long. His single opera, St. Francis of Assisi, requires a 10-part, 150-voice chorus, seven main solo roles and an orchestra of 110, including not one but five of the odd early electronic instrument called the ondes martenot. The instrument, which also plays a key role in the Turangalîla-Symphonie, was invented by a French musician in the late 1920s. It was soon picked up by a number of composers, including Darius Milhaud, Arthur Honegger and Edgard Varèse. The slithery sound can be ethereal, but in Turangalîla it often sings like a goddess, very much in keeping with Messiaen's philosophy of spirituality being woven into every aspect of life. For any music I conduct, it's essential that I discover a real sense of who the composer is. Olivier Messiaen, it's safe to say, was a unique guy from the start. With a poet mother and a Shakespeare professor for a father, Messiaen was destined for a distinctive and eclectic life. From his toy theater productions of Shakespeare plays when he was 8 years old, to composing music and learning the piano around the same age, Messiaen followed his own strong and innate sense of self. In 1919 the family moved to Paris, where Messiaen entered the Paris Conservatoire at age 11. There he studied with a wide variety of teachers, including the famed organist Marcel Dupré. Messiaen turned out to be an important organist himself. At age 22, he became the organist at the church Sainte-Trinité in Paris, a position he held for over 60 years until he died in 1992. Messiaen's compositions for the instrument constitute the largest contribution to the repertoire since Johann Sebastian Bach. Moderation, it seems, was not a big part of Messiaen's DNA. Another of his passions was birds. Beginning as a teenager, he collected thousands of bird calls and songs. His research was so intense that he became an expert ornithologist and was able to identify almost any bird he heard. Several of his compositions are devoted entirely to birdsong, and most of his other works include references to the songs of birds. But the single most important driving force in Messiaen's musical creations was his devout Catholic faith, which he also discovered at an early age. Even under appalling conditions, Messiaen's faith was steadfast. The most often told story is how he composed and premiered his best known work, Quatour pour la fin du temps (Quartet for the End of Time) while in a prisoner of war camp in the winter of 1940. Messiaen's music exudes a kind of spiritual ecstasy. "I am convinced that joy exists," he once said, "convinced that the invisible exists more than the visible, and that joy is beyond sorrow, and beauty is beyond horror." Messiaen seems to always be reaching towards an eternal light. He loved God in terms that were sensual, almost sexual. Human love and divine love were not opposites for him, but stages in a progression. In Turangalîla we can feel this spiritual ecstasy, especially in the fifth movement, called "Joie du Sang des Étoiles" (Joy of the Blood of the Stars) and in the finale. The repetitions, the kaleidoscopic colors and fevered dances carry us to an almost drug-induced frenzy. There is a distinct Eastern flavor to much of Turangalîla. Messiaen heard Balinese gamelan music at the Exposition Coloniale in Paris in 1931 and became obsessed with music from the East, particularly Indian music. He used pentatonic and octatonic scales, evoking the sound world of the Far East. But it was the Hindu rhythmic structures called talas that really drew him in. Talas are complex systems of rhythm created in Indian music using the power of math. The word "tala" literally means to clap, but it also refers to any kind of musical meter — it doesn't have to be regular — and in a larger context, tala refers to the cycle of life. Messiaen avoided regular meter, feeling it was too artificial. He pointed out that in nature things are not at all regular. For example, the branches of a tree and the waves of the sea are not even patterns. In Turangalîla, his eclectic interests and influences result in repetitions, sudden shifts of tempo and overlapping ideas. Combined with the otherworldly sound of the ondes martenot, he creates a totally distinctive musical vocabulary. "Turangalîa" is a combination of Sanskrit words, and according to Messiaen, its meaning is almost untranslatable. "Lîla" literally means "play," but also refers to a sense of divine intervention in the universe. "Lîla" also means "love." "Turanga" is movement and rhythm, but also the passage of time. "Turangalîa," Messiaen once wrote, "means, all at the same time, song of love, hymn to joy, time, movement, rhythm, life and death." As you can tell, nothing is simple with Messiaen! In the end, Messiaen's music for me is almost more of a philosophy than a compositional process. It's driven by rigorous methodology, of course, but the impetus emanates from an approach to life based on faith and love. This weekend, the thrilling and mysterious "Turangalila-Symphonie" by Olivier Messiaen is being performed by the Baltimore Symphony Orchestra. The masterpiece is rarely heard. It calls for over a hundred musicians and an unusual electronic instrument. We'll have more about that later. The music director of the Baltimore Symphony, Marin Alsop, joins us. Maestro, thanks so much for being with us again. MARIN ALSOP: Great to be here, Scott. Happy New Year to everyone. SIMON: And Happy New Year to you, of course. We're listening to a recording of the Bergen Philharmonic. Help us understand the composer and the importance of this work. ALSOP: Well, this is a massive piece. I mean, everything that Messiaen wrote was a journey piece. Music for him was more of a life philosophy than, you know, an actual composition. And in this piece, he's bringing together all of his spiritual beliefs, his interest in Indian music, his interest in music from the Far East, his love of birds, believe it or not - birdsong - and his incredibly devout religious fervor. SIMON: May I ask how many times you've performed it? ALSOP: You may ask. But the reality is that I've never even heard this piece live. So this is not only the first time I will conduct it. It's also the first time I will hear the piece live. And it's been on the Baltimore Symphony musicians' wish list for at least 20 years. So this is the first time they'll play it. SIMON: Oh, mercy. The piece is filled, I gather, with duets between instruments. What's that to achieve? ALSOP: You know, this idea of love, whether it's spiritual love or the love between human beings. This was a big part of Messiaen's philosophy and his life. And I think these duets that come through, they're often unexpected duets, you know, between unexpected instruments. So you'll hear one between the clarinet and this very weird electronic instrument that's also in the piece, called an ondes Martenot. SIMON: Oh, mercy. The clarinet I recognize. SIMON: Tell us about the ondes Martenot. ALSOP: Well, this was an instrument that, as you can probably deduce, it grew out of the idea of the theremin - you know that ooh. ALSOP: That kind of spooky sound. The theremin was invented earlier. And then this gentleman named Martenot, who was a cellist, but also, he was a radio operator during the war. And he wanted to try to bring those two loves together - you know, these radio waves and also the sound of the cello. And he created this just bizarre instrument. It's got a keyboard. But it also has a long cable with a ring on it that the operator - I don't know if should say the player - has to maneuver and create the pitches. And you can also add vibrato to it. So it's extremely fascinating instrument. ALSOP: I thought Ned was starting his car. SIMON: (Laughter). Sorry, our producer Ned Wharton. Needless to say, if your son or daughter comes to you and says, I'd like to play the ondes Martenot, it's not going to be easy, right? There can't be these many instruments in the world. ALSOP: Well, you know - but I think it would be a good career choice because there are not many ondes Martenot players around. It would probably require an education in Paris, though, because that is really where the school for ondes Martenot players exists. And I was just speaking to Nathalie Forget, who's playing ondes Martenot with us this weekend. She's fabulous. And she was telling me that she always travels with two instruments, you know. And they're quite complex because often customs will open one and, you know, try to tear it apart to see what's inside. So she always travels with two instruments. And she has to know how to repair them. So I don't know. It's an interesting career choice - not only a musician. You have to, you know, be a good repair person and mechanic and all kinds of things. SIMON: And why do you think Messiaen was so attracted to the instrument? ALSOP: You know, I think it's so outside of what we're expecting. And the sound world is so ethereal and otherworldly that it really - I think it goes beautifully hand in hand with his spiritual approach to living. And he was a man who existed almost in his own time, in his own space. And according to Jean-Yves Thibaudet, who's our marvelous soloist. And he worked on the piece with Messiaen. He said, you know, you knew he was there. But you always felt that he was also somewhere else. SIMON: The "Turangalila-Symphonie" is also filled with what sounds like very demanding - devilishly demanding, if I may, piano passages. Let's listen to one. SIMON: What came first - the piano composition or the pianist that composer had in mind? ALSOP: Oh. I think the pianist probably came first because he fell in love with her. She was a student of his at the conservatory - Yvonne Loriod. And he ended up writing many, many pieces for her to play. And she was a phenomenal virtuoso. And I guess she fell in love with him right away, too, as the story goes. SIMON: The symphony is filled with these asides, drama, invention. It can be loud. It can be thorny. But it ends with such ecstasy. SIMON: When you get to that section, what do you think the composer's evoking? What do you try and bring out? ALSOP: Well, you know, Messiaen's spirituality was about joy. And he was a man who felt that every human being had the potential to experience rapturous joy. And, you know, for a person who lived - he was a prisoner of war. And, you know, he maintained this sense of celebration and the belief, I think, in the human spirit and the human spirit as a spiritual entity. And that's how it feels. You know, it's almost like a drug-induced fervor at the end, you know, because it just keeps going, going, going, going. And then suddenly, a subito piano - quiet. And it just grows, explodes to the end. And it's a spectacular ending. SIMON: Marin Alsop. She will lead the Baltimore Symphony Orchestra this weekend in its performance of Olivier Messiaen's "Turangalila-Symphonie." Thanks so much, maestro. We'll look forward to it. ALSOP: Thanks so much, Scott. Great to talk to you. (SOUNDBITE OF ANGELA HEWITT'S PERFORMANCE OF OLIVIER MESSIAEN'S "TURANGALILA-SYMPHONIE") Transcript provided by NPR, Copyright NPR.